Who knew that getting a root canal could be so efficient? Dr. Caramico implements some of the most modern endodontic technology available. The result? Predictable, straightforward, quality treatments for you and your family. Endodontic treatment is necessary when a tooth has experienced nerve damage, deep infection, cracks or an abscess. Unlike a crown or filling that treats and restores the outside of a tooth, root canals repair the inside. This step allows you to preserve your natural tooth for several years to come. WaveOne root canals are so efficient, that your entire endodontic procedure can be completed in less time than ever without sacrificing the quality of your results. 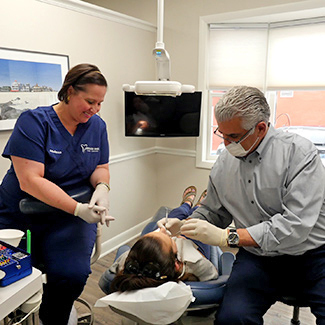 Using app driven technology, the WaveOne rotary system uses a cordless hand piece that syncs with an iPad, which Dr. Tony uses to direct the root canal. Because it’s computerized and not felt by hand, the therapy can usually be completed in nearly half the time. Experience today’s most advanced methods in root canal therapy. Contact us to schedule a consultation with Dr. Tony to learn more.